It’s diamond season. Almost 40 percent of American engagementshappen between Thanksgiving and Valentine’s Day, with Christmas the most popular day to pop the question – and hand over a sparkly piece of ice. Jewelry stores do at least double their usual monthly sales in December. Since at least the late 1800s, with the discovery of huge diamond mines in South Africa, people have treasured these dazzling gems. The beauty and splendor of diamonds goes well beyond the surface. Like a diamond hunter digging in an underground mine, one must look deeper to their atomic characteristics to understand what sets these stones apart – and what makes them valuable not just for romantics but also for scientists. When mined from the earth, diamonds look like cloudy rocks before they’re cut and polished. Their chemical nature and structure were unknown for centuries. It was Isaac Newton’s experiments in the 1600s that first suggested diamonds are made up of the fourth-most abundant element, carbon. People doubted Newton’s discovery, which is understandable considering how different diamonds look from other common forms of carbon, like the graphite in pencils or the ash left over in a wood-burning fireplace. But in 1797, English scientist Smithson Tennant confirmed the composition of diamonds. It turns out that carbon takes two common forms that have crystalline structures on the atomic level. Graphite is a repeating two-dimensional, honeycomb-like shape, with layers stacking on top of each other. Alternatively, carbon can form a repeating three-dimensional shape, a tetrahedron – and that’s your diamond. There are two sources of the precious gemstone: natural mining or synthesis within a laboratory. Natural diamonds are formed under intense pressure and heat in the Earth’s crust over millions of years. Natural deposits have been found all over the world, from Northern Canada to Western Australia, even underwater in Namibia. Mines were the only source of the gemstone until 1955, when General Electric produced the first synthetic diamond using what’s called the high-pressure, high-temperature process. This process works by applying hundreds of thousands pounds of pressure to graphite at 2,700 degrees Fahrenheit to force the carbon into the correct crystalline structure. It’s sort of like an artificial version of the extreme conditions that produce diamonds deep within the earth. In the 1970s, labs started to use the chemical vapor deposition method to grow diamonds at lower pressures. At the time, the HPHT technique couldn’t produce a gem-quality stone. This improved method converts a hydrocarbon gas mixture by breaking it down to its components, carbon and hydrogen molecules, with an intense heated filament or plasma and deposits it onto a substrate, ultimately forming a solid diamond. Originally, this process had a very slow growth rate, but it’s now optimized to grow quality diamonds within days. Together these techniques are largely responsible for human-made diamonds – upwards of 4 billion carats worldwide annually. There’s a common misconception that a natural diamond must be inherently different than a synthetic diamond. To the contrary, they are chemically identical and share the same physical properties. Even the most sophisticated techniques can not detect a difference between a flawless mined diamond and a flawless human-made diamond – both are “real” diamonds. However, truly flawless diamonds of either type are extremely scarce. The color of a diamond is graded on a scale from “D,” being perfectly colorless, to “Z” having the most color. Originally, the color of the stone was a huge hint about how it was formed because until 2007 about 90 percent of the high-pressure, high-temperature synthetic stones were yellow orange or yellow. Almost no stones from that process were colorless, so a colorless stone was almost certainly natural. But the HPHT growing process has greatly improved and as of 2016, 43 percent of synthetic diamonds were colorless. Diamond clarity indicates the presence of inclusions, or tiny imperfections, in the stone. Inclusions make every diamond unique and provide strong clues to whether a diamond is natural or synthetic. 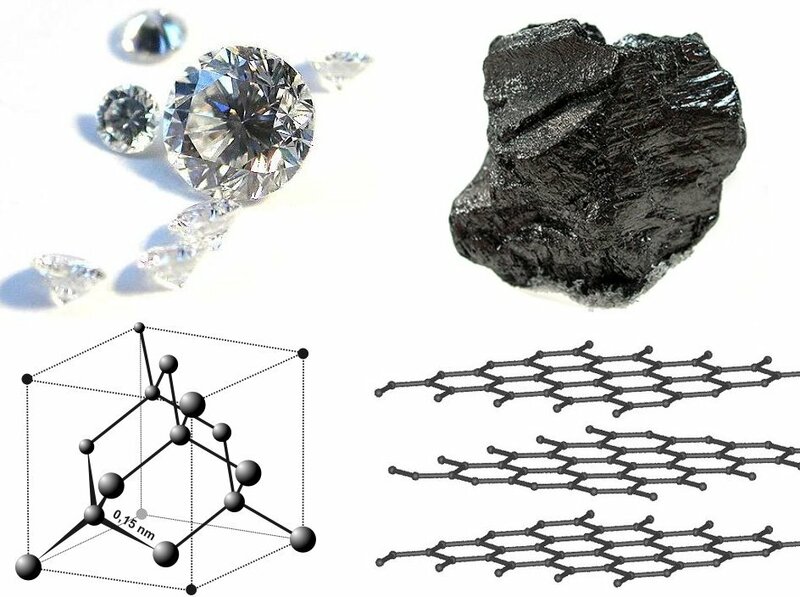 The HPHT process uses metal flux, or a hot metal liquid, which acts as a solvent to dissolve the carbon source, graphite, to be rearranged and grown into a diamond. Diamonds grown this way can have inclusions of metals. The resulting stones may be magnetic – if a diamond reacts with a magnet, it is certainly synthetic. Additionally, most synthetic diamonds receive high clarity grades, while natural diamonds contain larger inclusions. Many consumers focus on carat weight – that is, diamond size. The stone is weighed on a scale where one carat is 200 milligrams (0.007 ounces). Diamonds larger than four carats are almost guaranteed to be natural because that’s the limit for the size of the diamonds that the synthetic processes can grow. Although the “four Cs” of diamonds ultimately define retail value, sentimental value can be even greater. Buyers must decide if a natural or synthetic stone fits the bill for them, based on factors that might include the ecological and ethical ramifications of diamond mining as well as the lower price tag for synthetic rocks. Although diamonds are well known for their place in the jewelry industry, they play other valuable roles, too. Their physical properties, especially hardness, are ideal for abrasive applications. Small diamonds can be found coating cutting wheels, drill bits and grinding wheels, which are used for cutting concrete or brickwork. Diamonds also have certain optical properties that make them suitable for various spectroscopy techniques, or measurements involving the electromagnetic spectrum. Scientific researchers use these tests to help identify the composition of materials they’re investigating. A previously common place for diamonds was on record players, where to this day the needle that touches the record can be a very small diamond sliver. Whether one appreciates the aesthetic or scientific characteristics of the gem more, diamonds can dazzle. Older PostPreparing for Discovery With NASA's Parker Solar Probe!